Forget Bognor, Benidorm is where it is for a spot of winter running. 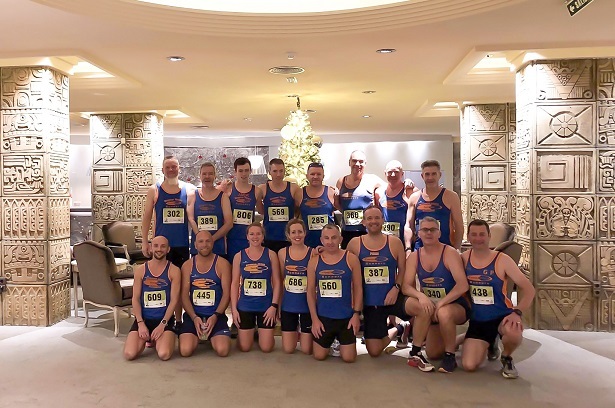 With wind and rains battering the south coast, a team of Tone Zoners headed to the south of Spain to take on the Benidorm 10k. A total of 16 club members signed up for the event, which was far from a holiday. First home for the club was Simon Gill, running a time of 35 minutes, closely followed by Peter Lee, in 37 minutes. Jack Penfold, who was running a strong race, stopped with a nose bleed halfway before finishing with Danny Mahoney just under 42 minutes. Chris Gallagher ran a personal best time for 44:14, followed by Nigel Pidgeon, who finished just over the 45 minute mark. Shaun Smart was just a few places behind, along with Marc Annals, who was still carrying an injury from last year’s race. Ian Baley finished just ahead of head coach Keith Hardwell, who had spent his weekend ensuring all runners were hydrated. It seemed to work for him as well, as he crossed the line in a time of 47 minutes. Carolyn Stapley, Karl Hayes and Glenn Penfold (who was running his first race in two years) all ran a close race and crossed the line under 50 minutes. Just missing out on that barrier was Neil Strudwick, who made his return to racing after the Chicago Marathon last month. Kate O’Connor and Neil Pacey rounded off a good weekend for the club, both finishing under 53 minutes. Tone Zone also claimed second place in the club rankings throughout the race meaning the flight home was a cheery one for the cohort of Bognor-based runners. Closer to home in Hampshire, over at Staunton Country Park, was the festive frolic, a 4.7 mile lapped course where runners can run any amount of laps they wanted to. Fellow Tone Zoners Tony Holcombe, Cheryl Laing and Andy Shill all ran nearly 28 miles of the course. Holcombe and Shill showed great teamwork to help each other around the course, finishing in 5:11, with Laing finishing 10 minutes later.